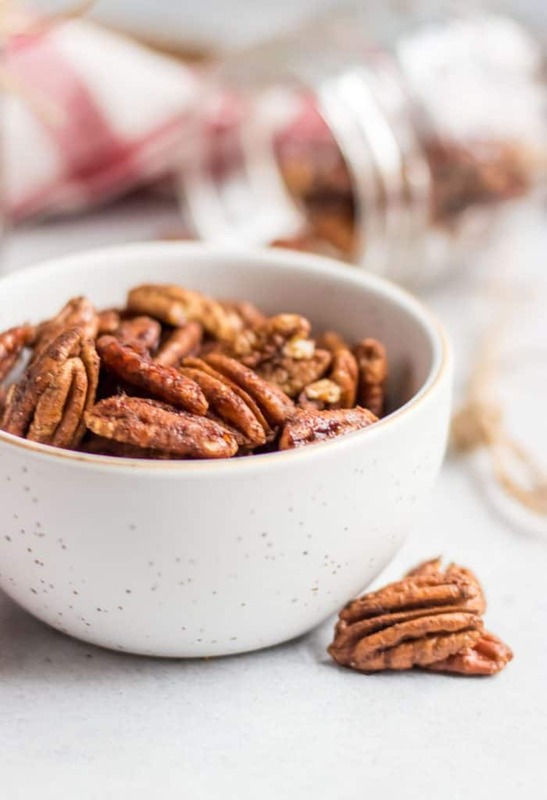 Simple roasted and maple sweetened spiced pecans recipe with a dusting of cinnamon and hints of vanilla are the perfect snack, holiday treat, salad topper and more! This easy recipe makes perfect holiday gifts as well! Sometimes the things we avoid are actually the things that we need the most. It’s often that the things that challenge us are the things that really allow us to learn about who we really and what we are made of. There is the risk of failure or pain and as humans, we would rather skip this route if necessary at times. When it comes to my yoga practice, I will admit that the thing I avoid the most is anything that requires balance, especially if it’s on one leg. Sure we are supposed to let go of the ego in yoga, but as a yoga teacher, swaying side to side or tumbling over in the middle of a class definitely takes a toll on my pride. Inside, I feel I can hear the thoughts around me, Seriously? How is she a teacher if she can’t even stand on one leg?! Naturally I am overreacting, but it doesn’t make it any easier. During a period of time, in my own personal practice, I began to just avoid anything that required me to stand on one leg. I had made up my mind that it didn’t matter how often I practiced, I was just always going to struggle with this. And I accepted it, and I moved on. I truly feel that what happens on your yoga mat can be a representation of what is happening in your life off of the mat. So clearly, if I need to work at balancing on my mat, then it must be showing up in my own life somehow. So then, what do I gain from avoidance? Nothing. Recently, I decided enough was enough. I couldn’t avoid it forever. So I started to double the amount of balancing poses in my practice. I promise you this was not fun at all in the beginning. I rocked side to side and tipped this way and that. Many times I could not stay up for more than a breath and other times I didn’t breathe at all. Over time, I started to become more aware of the fluctuations of my balance. Some days I could easily stay afloat in tree pose while other days I was a tree flailing its branches through the storm. After a while, I was starting to see patterns and making connections on and off of my mat. And along the way, I even learned a few things. This is what I learned about balance. Balance is not about standing still. It is not about standing on one foot. It is not how long you can hold tree pose. Balance is about working through the ebbs and flows of daily life. Balance is the natural movement of the pendulum moving in equal, opposite directions; If I am pushed in one direction, then I have the strength to pull back in the other. It is perseverance and calm when the lows come after us. It is falling down 7 times and getting back up 8. And to think, all this time balance was nothing more than how long I could stay in a pose and yet it was not that at all. I will say working through this didn’t make me enjoy standing on one leg more in any way at all. However, it made me see that we gain absolutely nothing when we avoid challenge. Sure, it’s tough and it really can be so much easier to just keep hiding from whatever it may be, but then how do we grow? What do we learn? How can we change? I saw that if I really did accept a challenge then there could be change, not perfection, but change. I was not destined to stand on two feet at all times for the rest of my life. I was, in fact, capable. Even I surprised myself. So what is it that you are hiding from? What challenge is waiting at your door? And what are you gaining from avoiding it? Nothing, absolutely nothing. My absolute favorite nuts are pecans. I throw them on salads, oats, treats and more. They have plenty of health benefits including lowering breast cancer risk, promoting heart health, lowering blood pressure and more. I really like them raw and as is, but I eat so many of them and recently wanted to spice things up a bit. 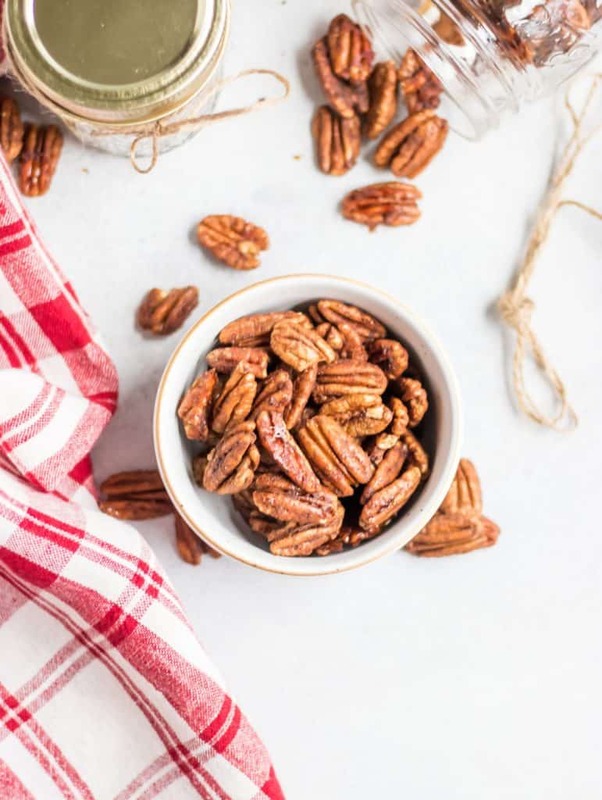 And thus this spiced pecan recipe became my new go to snack! 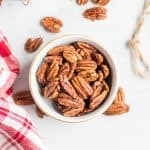 Spring can’t come soon enough and I love to add spiced pecans to a big salad with strawberries and avocado. They are also amaaaaaazing on ice cream. Trust me, crush these up on a big scoop of vanilla ice cream. You won’t be disappointed. These are so simple to make and very versatile. 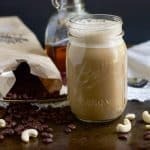 Not a lot of work goes into this recipe but if you share these with friends, they will think you must’ve gone through so much trouble to make them! I know it’s not the holiday season, but they also make great gifts. Of course, I am not so sure you will actually want to share these, buuuuut, every year around the holidays, I make a bunch of these and put them in a pretty jar–voila! The gift that keeps on giving, well at least until they are all gone, right!? Looking for some more treats what work well as gifts during the holidays? Check these out! There are also a ton of ideas here as well. 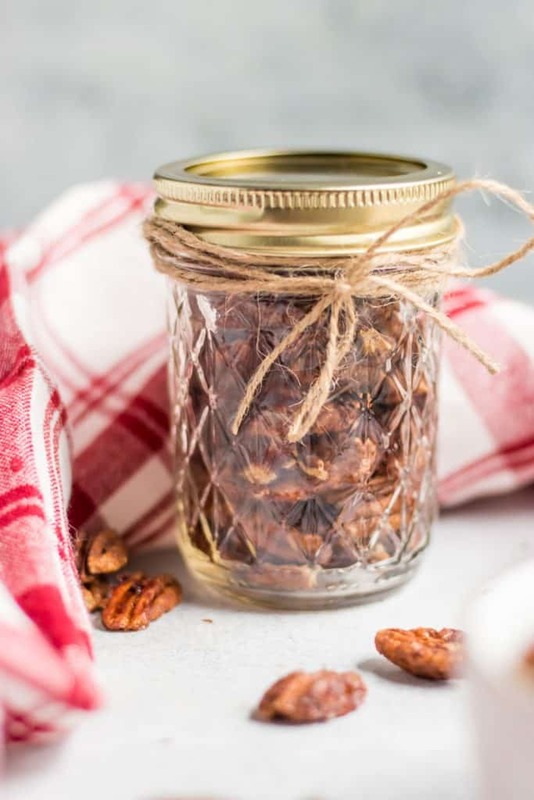 There are plenty of other spiced pecans recipes out there as well, including these Pumpkin Spiced mixed nuts that could easily be made with just pecans. Who’s getting hungry now?? Combine pecans, maple syrup, vanilla and coconut in a small mixing bowl. Stir until all of the pecans are coated. Add in cinnamon and stir until pecans are evenly coated. Spread pecans on a baking sheet lined with parchment paper. Let cool completely before eating and store in an airtight container. Agreed! Sometimes the most challenging things are exactly the things we need to embrace more often! Trust me Deryn, I need the reminder for myself ALL the time. The more I avoid it, the more I need it! Enjoy the pecans! I will have to get a couple bowls of these around the house for the holidays! They sound so good! I love your story about connecting your practice to what you’re going through off the mat. Yoga is such an incredible tool for growth. And these pecans look amazing! Definitely going to try these for a few holiday gifts! It really is! The pecans are unreal I promise! 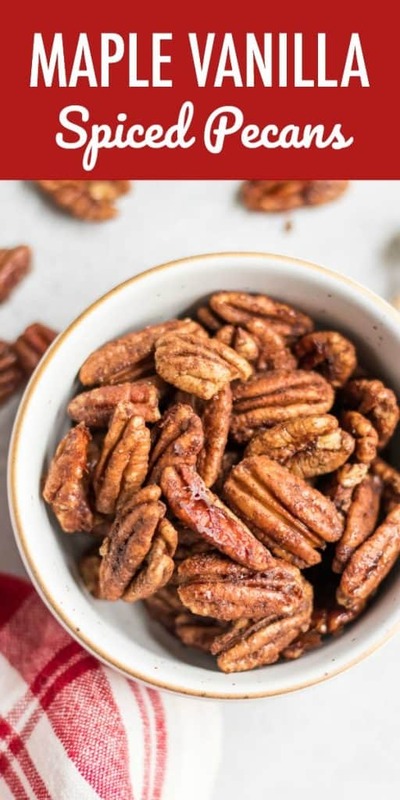 These pecans look DELICIOUS! So perfect for fall and a great snack/dessert. Definitely want to try them out! They are ready in minutes so you won’t have to wait too long! I LOVE anything with maple, especially candied pecans! Always a hit for everyone! These look great for holiday gifts! I hand them out every year–and with no complaints! These were so easy and delicious! YUM! These are such a great homemade gift! Forget the cookies and fruit cake; people want these under their Christmas tree!! Every year Ransom’s FAVORITE thing to do is use all the nutcrackers in the house to literally crack and entire bag of shelled nuts. I think I am going to make this with them (if there’s anything left). Pecans are my favorite! Wow, send him my way next!! I have been making and giving these as gifts for 2 years now. They are soooo easy to make and a crowd-pleaser. Oh and totally a kid-pleaser too.